1) Find the mean of the values of the independent variable X. 2) Find the mean of the values of the dependent variable Y. 3) Find the deviations in X by subtracting the mean of X from each X value and the deviations in Y by subtracting the mean of Y from each Y value. 4) Multiply the respective results from steps 3 and 4. 5) Find the average of the results from step 5. This average is the value of the covariance. Calculate the covariance of the given bivariate data set. 1) Find the mean of X. 2) Find the mean of Y. 3) Find the deviations in X and Y. 4) Find the product of the deviations in X and Y. 5) Find the average of the products obtained from step 4. The negative covariance implies an inverse relationship between X and Y. 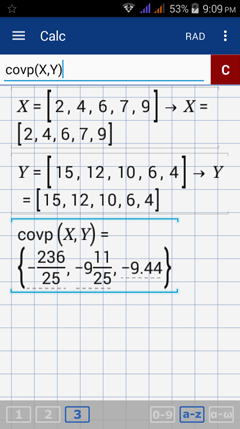 To find a covariance using the app, use the cov and covp functions by holding the factorial (n!) key and selecting "cov" or "covp" respectively. "cov" is used to find the covariance of a sample while "covp" is used to find the covariance of a population. 1) Enter the data sets in matrix form. Enter the values for X in one matrix and the values of Y in another matrix. Use different names for these matrices, X and Y for example. Note: Matrices X and Y must have the same length. 2) Hold the factorial (n!) key and select cov (for a sample) or covp (for a population). 3) Enter the names of the matrix in the order: cov (X, Y) or covp (X, Y). Using the same data set, calculate the covariance using the "cov" or "covp" key, whichever is appropriate.